Doesn’t the marbled chocolate make this look so pretty? As is my wont, I set myself various ambitious goals at yon time when the wedding day seemed like an occasion far, far into the future. Most of them, in a purely shallow fashion, centred around being a size 6, sporting arms like Madonna and having come through the other side of the world’s harshest detox to guarantee skin so fresh, shiny and young-looking people mistook me for a 39-year-old instead of a… (er, ladylike modesty forbids me to reveal the truth dear reader). Aye, all rather shallow hmm? So, what happened instead? There was wine, ladies and gentlemen. There were cakes and there was a lot of cheese. Yum! So, I’m now on Atkins*. Rumour has it that the 5.2 diet and the Cambridge diet are among those my guests are trying. Possibly I should contact said diet companies and ask for commission…? So yes, Atkins, and carbs are now the mere daydream of mashed potatoes, or the enticing whiff of baked goods. 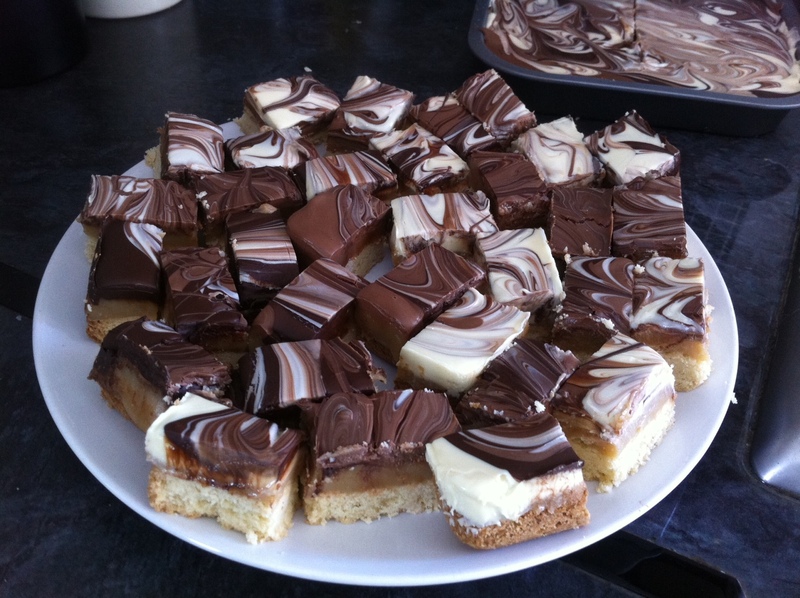 To compensate for my carb-free life, I made millionaire’s shortbread today** to serve as favours for my wedding. I cut the normal sized-pieces into cute mini portions and I’ll be putting a couple of each into a china teacup and adding a hand-written note. Kitsch hmm? I have to share the recipe for the shortbread as it’s one of the world’s nicest biscuits and three trillion times (at least) nicer home-made. Combine the flours and sugar in a mixing bowl and rub in the butter until it resembles breadcrumbs. Bring the whole lot together until it forms a bowl, divide in two and press into the bases of the two tins. Cook in the oven for 20-25 minutes until lightly golden. Leave to cool, but do not remove from the tin. Place the condensed milk, unsalted butter and dark brown soft sugar into a heavy based sauce pan and heat very gently until the butter has melted and the sugar dissolved. Bring to the boil slowly, stirring all the time. Once it has boiled, turn down to a simmer and cook for five minutes. The mixture will turn a lovely fudgy colour. Pour half over one shortbread base, and half over the other. Leave to cool and set. Melt the three chocolates separately (I favour 30-sec bursts in the microwave) and place spoonfuls of each kind over the cooled caramel and shortbread. Aim to roughly cover each surface in the three different kinds of chocolate and then lightly tap the tin on the surface so that the chocolates merge into one. Using a skewer or a knife tip, swirl the chocolates to create a marbled effect. Leave to cool and cut into small squares. You’ll get roughly 40-45 squares from this, but mini ones look sweet. Tip – if you cut this up before the chocolate has fully set, the chocolate topping won’t crack. *Atkins, for those of you for whom dieting is a blissfully unfamiliar habit, is a low-carbohydrate/ high protein diet. While unlimited eggs, bacon and steak sounds good in theory, without toast, chips and other starchy gloriousness it all gets rather tedious after a while. It does, however, produce results though if you do it and fall desperately ill, IT IS NOTHING TO DO WITH MOI. **Worry not, the said millionaire’s shortbread is currently residing in my freezer so it can be just-baked fresh on the day. Well, as long as it’s taunting you too!